1. 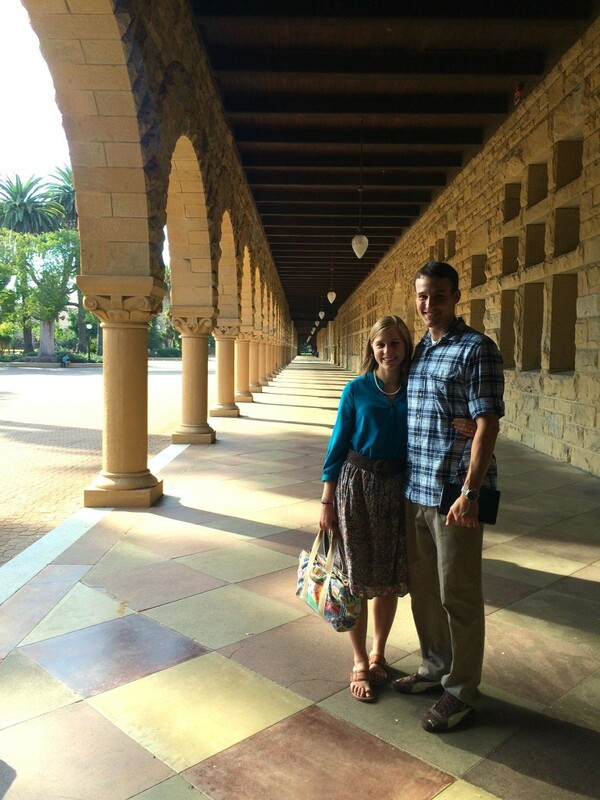 I don’t know why, but I was expecting Stanford to have classical architecture like the University of Virginia. Instead the campus is more Spanish colonial revival with a modern flare. The sandstone buildings combined with the beautiful weather make the whole campus feel energetic and sunny. Or maybe it was just so good to feel the sun on our skin again. It officially feels like winter here in Cincinnati. 2. Staying up way too late with these two, even though they both had school in the morning. 3. A girl’s only cousin lunch (really just because both the boys were in class). It’s wonderful that our husbands are such good friends, but girl time is still needed. 4. Rock climbing in the Stanford gym. 5. Getting to meet our darling new niece. 6. Sitting in on the Stanford Entrepreneur class and listening to Alex Shultz of Facebook talk about SEO in person. When I told my brother about this later, he was much less impressed. Apparently Peter Thiel, who spoke the lecture before, is much cooler. You can listen to the whole lecture series for free here. 7. Attending convocation in the beautiful cathedral in the center of campus and listening to a quartet’s voices fill the chapel. This church has amazing a acoustics! Also, several speakers talked about Jane Stanford’s role in building the cathedral. After her husband’s death, Jane Stanford almost single handedly funded and ran Stanford. She felt strongly that students needed to supplement their intellectual learning with spiritual learning. (Hence the cathedral for all faiths in the middle of campus). I looked up Jane Stanford when we got home. Turns out she’s more interesting than the speaker’s let on. Apparently she was poisoned at least once (and caught it). Weeks after she detected the first poison, she declared that she had been poisoned again and died. The cause of her death was never conclusively determined although trace amounts of poison were found in her body and in the soda that she was drinking right before her death. 8. Spending time with family. Spencer’s Mom was in for the weekend, and Spencer’s sister lived in the area. Turns out that we were lucky to see so much family because Emily is about to move a few hours away. Spencer’s mom took the whole gang out to dinner our last night, and then Spencer crashed on the floor in Emily’s home (he worked hard those two days) while I got to catch up with the fam. 9. The number of people who went out of their way to meet with Spencer, or help Spencer meet with people. Thank you loyal alumni network/friends/family! 10. Flying. It never gets old. Or maybe sleeping never gets old since I never manage to stay awake long enough for the plane to take off. There’s something soothing about knowing that you’re going places without any effort on your part. 11. Our two year old niece’s bouncing tigger dance moves and that she immediately decided that my cousin was her BFF. We had so much fun with you guys!! Thanks for taking time to see us! Thanks for letting us crash the party! I’m so glad we came before the move so that we got to see you!